In the narrow northern Valley of the Inn the fortress of Kufstein had been erected as a defence fortification during the Middle Ages. Today it attracts a great amount of tourists. In the 1990’s because of the overgrowing vegetation, parts of the historic building structure were close to decay. 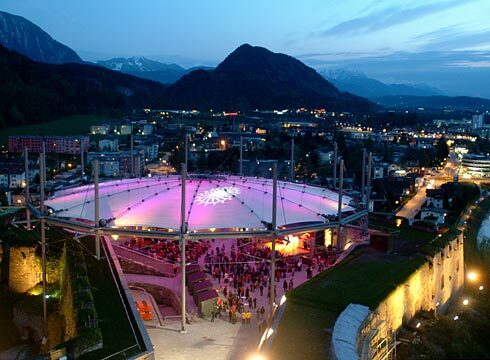 Therefore in 1997 the “Top City Kufstein” was founded to reactivate the fort and put in on the market. Besides of the gradual restauration, the businesses food and open air events became established, especially in the southern courtyard of the Josefsburg. Simultaniously by the fact of having more and more high quality events, the risk for ticket cancellations grew because of unpredictable weather conditions: The result was financial loss. Therefore the idea of a mobile shelter in the case of rain arose, protecting as big an area of the courtyard as possible. Further requirements were set by the officials for landmark sites not allowing any kind of anchorage into the existing fort. At the same time any new structure was not supposed to interfere with the visual appearance of the location. To comply with these facts, the designers developed a delicate, centrical cable structure. A membrane located in its center can be unfolded during bad weather conditions, similar to a huge umbrella. Covering a 2,000 sqm area, the umbrella can be opened or closed within 4 minutes. The bearing structure for the membrane covers a circular floorplan, consisting at the outside of a polygonal pressure ring, not dissimilar to a 52 m diameter “bicycle wheel”, composed of 15 equal segments. In its nodal points the ring is supported by 15 columns, located at the borderline of the courtyard just in front of the casemates. Within the pressure ring, 15 upper and lower spoke cables are running in radial direction, connected by vertical wires to a crescent-shaped geometry. The upper spoke cables are fixed at the top end of the columns, the lower at the nodes of the pressure ring, composing a hub in its center. The bicycle wheel is an efficient, highly prestressed bearing structure, that besides of the wind load, brings vertical loads only to the foundations. Because of the landmark site requirements not allowing the columns to be founded on the casemates, 5 of the 15 columns are constructed as floating columns, suspended by 30 crossing diagonal cables. At the lower end of the floating columns a circumferential ringcable shorts the traction at the top of the columns via brackets. The columns together with the circular thrust ring appear similar to a “tiara”, floating above the courtyard.